Thanks for the photo compilation, Bridget – a beautiful way to ‘see’ the eclipse if it wasn’t visible where we are (or were, since it’s past). The energies around the eclipse were intense! Thanks Jamie! It gives a new look from conventional photos of the eclipse, as it shows the transition from red to white moon a little more lucidly. Yes, energies are intense, getting lots of work done! :). Thank you so much. Yes, the moon is awesome! MOOOOON…. WELL DONE! Great compilation! 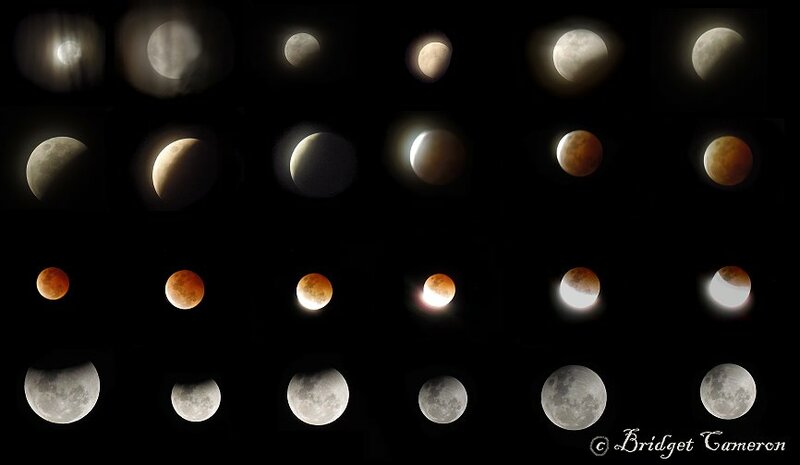 Very nice set of images completely describing the Lunar eclipse with authentic supporting text. This is the first time I saw the images of copper colored moon during its eclipse! Thanks for sharing. Great capture! I love that you showed all the stages side by side. It tells a great story, & it’s a very creative take on the eclipse! Thank you so much Rena. I had fun thinking up a new format!